Tropical Island Paradise by celebrated artist Gerald Newton. Measures 18" x 24" when complete. 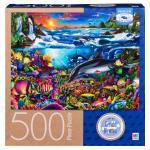 Manufactured on premium quality blue board, the Milton Bradley line of Cardinal Puzzles piece together effortlessly to craft artistic wonders. Our specially designed puzzles ensure every piece is different and fits tightly. Durable thick pieces snap into place making for a most satisfying build. The matte finish cuts down on glare and gives a picture-perfect finish. Use the included box easel to display the puzzle box top as reference, while the resealable storage bag keeps your pieces securely in one place.